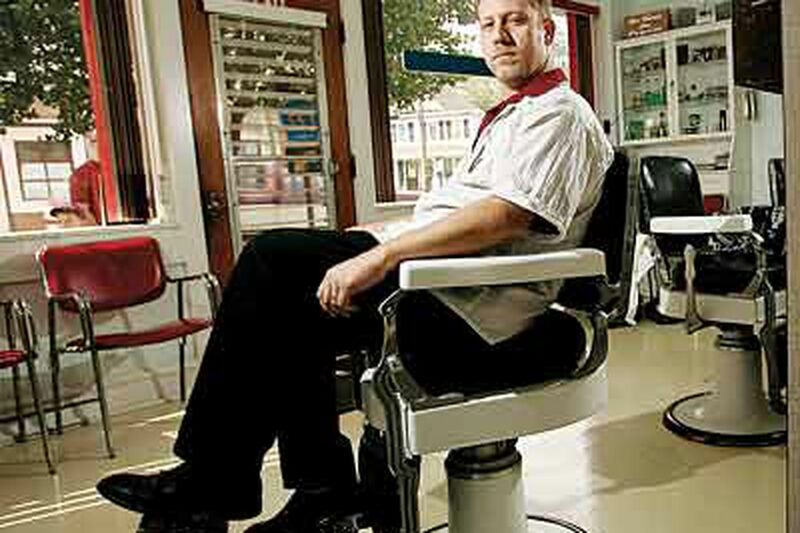 A barber with a chronic disease falls deeper into dept. Marty Grassia owns Pete's Barber Shop in the small town of Mantua in Gloucester County. It's a soothing but busy shop with three art-deco barber chairs and Sinatra crooning all day. Marty is married, with children ages 9, 7, and 6, and a Labrador retriever, Zoe. It could be a Norman Rockwell picture of what's right about America. Until you get to health care. Grassia, 36, has Crohn's disease, a chronic and painful inflammation of the intestines that can lead to life-threatening complications. He says he can't afford insurance for his wife and himself. He spent $40,000 on medical care in the last year, wiping out his savings. He still owes $20,000 in medical bills. The interest each month on his credit card, he said, is $400. "That's a lot of haircuts," he says. From September to May, he spent 30 days in Underwood-Memorial Hospital in Woodbury and missed 60 days of work. "My credit card is pushed to the max," he says. "My savings are depleted. I'm at the breaking point." He's been feeling better lately, but adds: "I'm basically living week to week. If I get sick again, I don't know what will happen." His children, at least, are covered through New Jersey FamilyCare, a program for working families. "It's a godsend," he says of that program, although his income is too high for him and his wife, Debrah, to qualify. "Without it, I'd probably be living with my mother." Grassia started at the barbershop in 1996, and felt at home right away. After six months, then-owner Pete Scaffidi told him, "You're going to own this place one day." The same year he started working at the shop, he got married, and he had insurance through his wife's job at a bank. But in 1998, pregnant, she quit her job. The couple paid $350 a month to continue her minimal insurance for a few years to cover the deliveries. Grassia let his own coverage lapse, figuring he wouldn't need it. Six months later, he was diagnosed with Crohn's. "I just had constant stomach problems and indigestion," he recalls. "Eat, and within five minutes I was in the bathroom." He managed the illness until 2001 when it flared up again, resulting in costly treatments and surgery to remove 12 inches of his intestines. It exhausted his savings. When he felt better, he looked to buy insurance, but couldn't find anything affordable. The cheapest he was able to find, he said, cost him $1,000 a month only for himself, and that covered only 50 percent of his medications. "The cost of insurance is astronomical," he says, "and so is the cost of getting sick. I play a game: How long can I stay well?" It is a game he is losing badly. For several years, Grassia did feel better, and in 2006, having saved a little money and feeling well enough, he fulfilled the prophecy and bought the barber shop for a modest down payment. Scaffidi, the former owner, holds the mortgage, charging very low interest, and Grassia pays him each month. But in September, the Crohn's returned. Doctors wanted to avoid surgery again if possible. For months he paid for tests, medications, doctors, all out-of-pocket. Grassia thinks that all along, he has gotten great medical care. By April, his savings were exhausted, and doctors determined that he urgently needed surgery. They feared a perforated bowel, which can be fatal. When he told his surgeon, John M. Erbicella, that he had no money, the doctor agreed to cut his bill in half, Grassia said, down to $1,145. Grassia says that's probably still more than the doctor would have gotten from an insurance company. The surgeon also agreed, Grassia said, to let him pay half up front and $100 a month until the debt was paid. Grassia said he then went to South Jersey Anesthesia, with offices at the hospital, and made a similar request: perhaps get a discount, and pay half the fee up front, half later. He says a woman in the office responded, "Well, we can put you under for half the surgery." When reached by phone last week, a woman in the office said she could not believe such a remark would ever have been made. She did say private-pay patients are generally charged in full because "we don't see the patient back. When it comes to anesthesia, we'll never see them again." The head of the office could not be reached. Grassia tries to see things positively, and assumed the woman was trying to be funny, to break any tension. But she insisted he pay in full. "This was on a Monday," he recalls. "I needed surgery on a Thursday. Where was I going to get the money?" He went to the bank, got a cash advance on his Visa, and paid the anesthesiologist $1,400, he says. "I never got behind on my mortgages," Grassia said the other day. "But any type of little savings I had is gone. Gone. I'm just tapped." Grassia's financial hole doesn't include hospital costs. Luckily, Underwood gave him charity care, as nonprofit hospitals do to justify their tax-free status. Grassia didn't pay a dime for 30 days of care. He is grateful. But he says he's been paying taxes since he was 15, and doesn't feel bad accepting help. After the surgery in late April, doctors wanted him to stay home, rest and recover. But Grassia couldn't afford it. "I come to work and I'm dying," he recalls. "I'm popping Vicodin after Vicodin just to stand here, just to make money for the day, so I can pay these bills." During his ordeal, there were several medications doctors told him would help. But he skimped on dosages, or went without. "One anti-inflamatory, Pentasa, is $392 a month," he says. "The amount they want me to take - I take half of that." Among his many debts, Grassia said he owes Booth Radiology about $3,000, and sends them $50 every time he gets a bill. "I constantly use them, so I constantly pay them and pay them and pay them," he said. Jeanne Stark, director of marketing for Booth Radiology, says her company works with patients on a case-by-case basis when they have trouble paying bills, and if patients make a good faith effort to pay each month, their accounts won't be sent to a collection agent. By the end of summer, Grassia was looking and feeling much better. He is upbeat, confident he'll make it through the next crisis. "If you're a hardworking American," he says, "you should have affordable health care." Marty Grassia owns a small business and his home, and supports a wife and three children. But he says he could not afford to pay for health insurance. The premiums were just too high, especially because he had a preexisting condition - Crohn's disease, a chronic inflammation of the intestines. When his disease flared up in the last year, he spent $40,000 on doctors, tests and medications. He has exhausted all savings, and owes $20,000 on his credit card. Karen Goroncy works for a home health agency and takes care of people for a living. Her agency pays her about $10 an hour and offers her health insurance, but the premiums are too expensive, so she goes without it. She has developed a hernia and other health issues from years of lifting and taking care of others, yet she can't afford to take care of her own health concerns. More than 70 percent of uninsured adults below retirement age are working. About half are white, 30 percent are Hispanic, and 14 percent are black. About 85 percent have less than a college degree. Those from ages 18 to 44 compose 60 percent of the total. Children make up only 19 percent, since many are covered by government programs. Contact staff writer Michael Vitez at 215-854-5639 or mvitez@phillynews.com.